The last time I met my parents was in November when they came to visit for a rainy week in Nerja, outside of Malaga. At the time they were talking about this wedding they were going to attend. My sister Maria's brother-in-law Scott from Australia and his girlfriend Ashley from South Africa were going to tie the knot in Thailand. Great I thought, they are a wonderful couple. It would have been fun to go but we are too distant as relatives to be invited, I presumed. Shortly after my parents had returned to Sweden I got a message; “The card says you are invited too. RSVP as soon as possible. Our mistake! Hugs and kisses! Mom”. Alright! Time for a vacation! It has been almost a year since I saw my sister and her family, and even longer since I met the extended family from Australia. 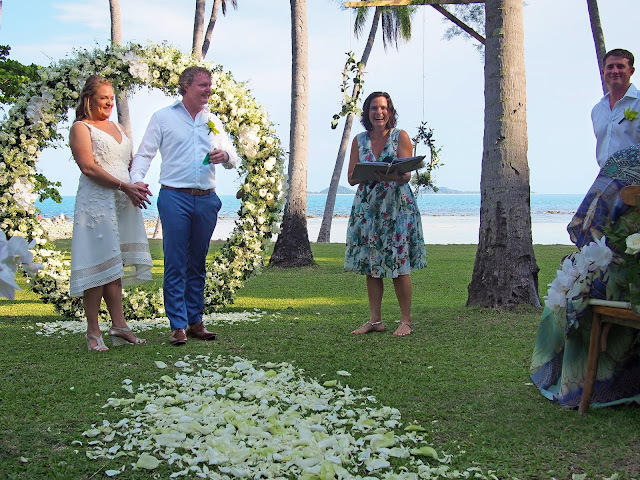 A wedding is the perfect event to gather a lot of family and friends from all over. Going to Thailand was just a bonus. The flight was spent catching up with recent movies, we haven't been to the cinema since we left Sweden. The wedding was as awesome as anybody could have imagined and there is no doubt in my mind this amazing couple will have a magnificent life together. After all, Scott works at a gin distillery and Ash is an event planner. Have you ever heard of a better match? Family from Sweden and Australia. In-law Adam with my nephew Noah. Mom, sister, girlfriend, me and dad. Brave kids walking the aisle. I have been dreaming, planning, saving, for the better part of a decade. Yet when the conceived hour of departure came and passed I hadn't even packed my bags, still contemplating what of my few possessions to bring and what to discard. I hadn't even had the time to meet with all the friends and family that I would have wanted, giving me a slight bad conscience. It's usually how it goes. When I left for Australia almost three years ago I was still mopping the floor in my soon to be someone elses apartment at 6 AM when the taxi pulled up outside. My oldest tab in my internet browser, several years and counting, is an article called How to Beat Procrastination by WaitButWhy. How to beat procrastination. It's right there. Some day I am going to read it, dammit! Yes, I have issues. Several hours too late in the day Sofia and I finally and hastily put the panniers on the bikes, hugged the closest family goodbye and with dad filming we were on our way. "What if the wind always blows counter clockwise around this island, and everybody but us knows this? What if we're going the wrong way? ", I thought over and over and over as we were fighting against a brutal headwind, again. This wasn't the first time this kind of paranoia hit me, and it's not going to be the last, because I never plan ahead for some reason. We met Uwe on the ferry, driving an electric motorcycle, a first on Iceland. He knew exactly where he could charge his Zero S. Two German cyclists on the same boat knew precisely where to camp. Me, I don't even know how I ended up in Iceland! A month ago Sofia and I discussed whether we should go to the Faroe Islands for a week, or rather just hurry down to warmer climate. Instead, somehow, we are spending more than a month in the cold. Sweden and Denmark are pretty flat, combined with the excellent weather most days were a leisure usually ending with a bottle of wine at the beach. 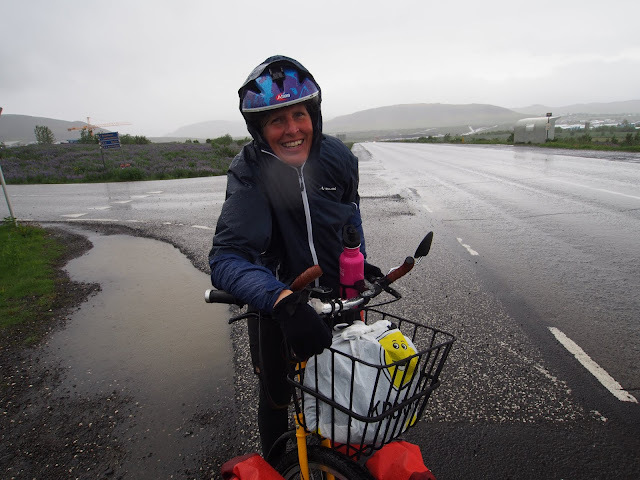 The constant headwinds have made our progress slow, but time still relentlessly keeps going and we have to cycle back to Seyðisfjörður sooner rather than later to catch the ferry back. Back to blue skies. We silently prayed to the weather gods but instead of the tailwind we wished for the little luck we have had with rain ran out and as soon as we left Reykjavik it started to pour. Pour sideways. The traffic out of Reykjavik is horrible, even though more than one person gave us an encouraging gesture. One young man was halfway outside of the car screaming to us. A gap in traffic means photo opportunity! I shut myself in, inside my raingear and inside my mind. The traffic issue solved itself, since cycling is banned through a tunnel just north of the city. 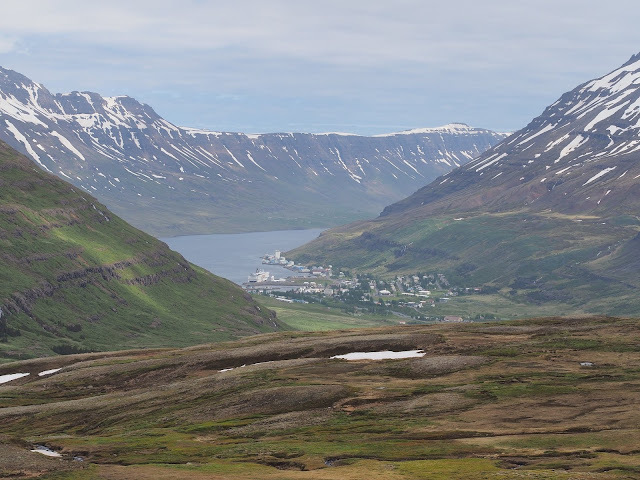 To travel further, one has to cycle around the fjord of Hvalfjörður, a detour of 70 kilometers or so.